There has been numerous threads lately about intercoolers. From the usual which one is the best FMIC on the market to Ebay brands claiming to offer a high quality solution for a reasonable price. Intercoolers and why replacement is recommended? Turbochargers compress engine intake air which creates heat. The Intercooler then cools down the charged air. For remapped cars, temperatures up to 200°C after turbocharger can occur. Factory intercoolers are unable to sufficiently handle such high temperatures. This causes high intake temperatures and the oxygen content of the charged air drops significantly. As a direct consequence, the performance decreases, the thermal load on the cylinder head and valves increases. Worst case this can cause severe engine damage. The colder the intake air, the higher the efficiency of the turbo-charged engine and less risk of engine damage. This can be achieved with an optimized intercooler system installed between the turbocharger and engine. Intercoolers can be categorized by two types of the core construction. The BAR & PLATE core construction is relatively heavy so there is certain temperature inertia. Meaning under load the core takes longer to heat, but also longer to cool down once the load is removed. This is fine for on the road, but for use on the race track this core construction is not particularly suitable as it arrives at a constant cooling performance at varying loads in the full load range. Also weight reduction is an important consideration for track use. The fine structure of the TUBE & FIN core makes them relatively light and exchange heat much faster. This type of core construction takes temperatures relatively quickly, but also very quickly transfers this away again. For a constant cooling performance in a dynamic throttle situation this is an indispensable feature. Tube fin intercoolers are suitable for street use as well as at the race track. The OUTSIDE CORE is responsible for heat exchange with the running wind. The higher the density of the external core (fins), the better the cooling performance of an intercooler. But you also have to look which parts are behind the intercooler. Too much fin density means all parts behind the intercooler will be blocked. The worst case would be, you’ve solved the problem of high intake air temperatures, but the engine coolant temperature climbs. High performance manufacturers note all these factors and develop the most suitable structure of outside core design. The INSIDE CORE is responsible for heat exchange with the hot charged air and also need to handle the additional air flow which is running through the intake system. Care needs to be taken when deciding the internal fin density. 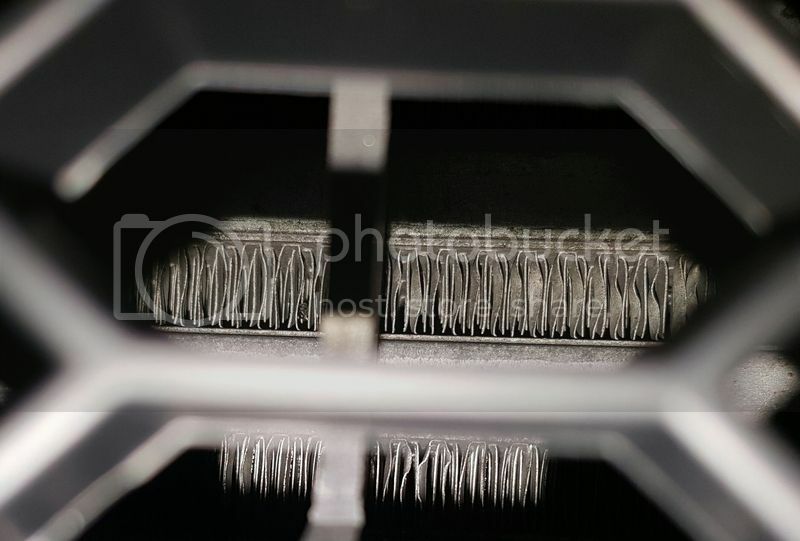 A high internal fin density gives great cooling performance but with a high pressure drop. The pressure drop of the cooling system should not be adversely affected by an aftermarket intercooler. Less pressure drop reduces the mechanical load on the turbocharger (stability & life time for the turbo). High performance intercooler manufacturers find the best balance between high cooling performance, reduced pressure drop and design their intercooler cores specifically for each vehicle. The right ENTANK DESIGN is another key consideration when you are looking for the best intercooler for your car. 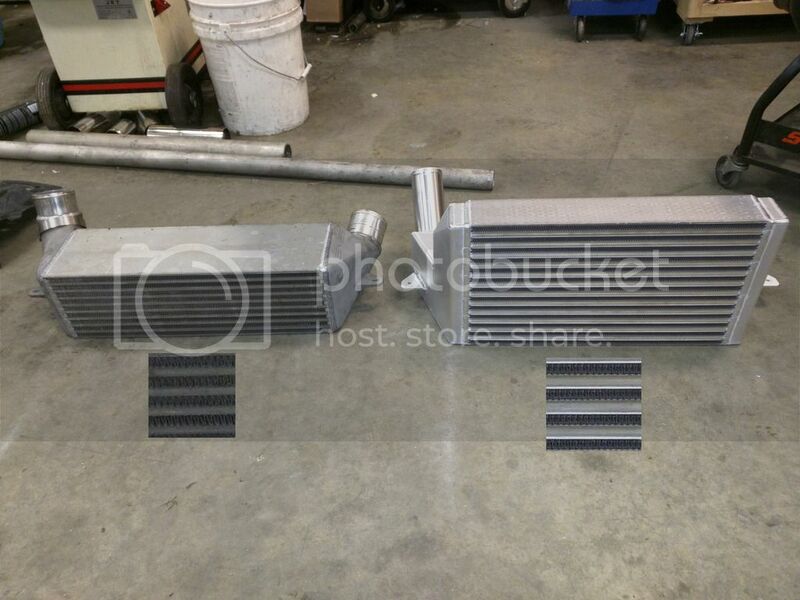 It is easy to see the difference between a good and a bad aftermarket intercooler. There are different approaches, some manufacturers use sheet metal end tanks and others use cast aluminium end tanks. At flow velocities of around 100 m/s it makes no sense to let the air flow straight in to a wall. This causes unwanted turbulence inside the end tank and higher pressure drop. Furthermore, uniform filling of the intercooler is critical for optimum performance. To aid this, some manufacturers add internal air guides. The size of an intercooler is not always proof of better cooling. There is an old adage which says "Power is nothing without control". This can be applied to bigger intercoolers. If you construct a bigger intercooler without working with internal air guide systems and flow optimized end tanks, the air will not flow through the whole system and choosing a bigger intercooler makes no sense because the intercooler is not being used effectively. Although the size of the intercooler is changing, the installation should not require mutilation of the vehicle. To avoid nasty surprises you should always look at the installation instructions (if available). Additionally you can seek reviews from neutral and professional sources. I know sometimes it is quite difficult to recognize those sources. 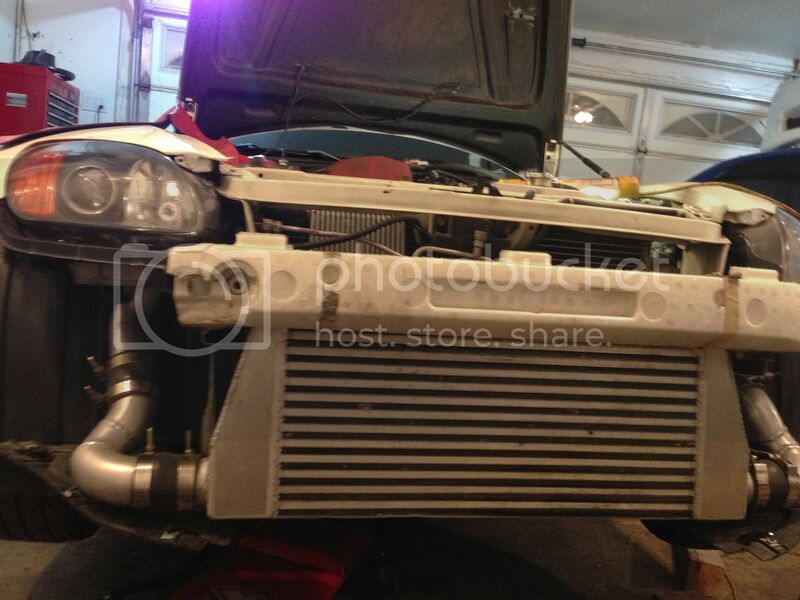 Don’t get an intercooler because someone on the forum says it’s cheap, it fits and they feel it is doing a great job. Ask for logs. Check if the manufacturer invests time and money in development/engineering, to get the latest technology in your intercooler. The needs of the cars and tuning them changes all the time. Don’t get an intercooler just because people say it is the best. Get an intercooler because professional tuners say it the best. The best intercooler on a fully bolt on car with upgraded turbo might not be the best intercooler for a stock car with stage 1 tune. Start by thinking ahead in terms of modifications that you will eventually add on your car. If you plan on going fully bolt on in 1-2 years, get an intercooler that suits the fully bolt on application. Bigger is not always better. If you do not plan on getting stage 2 turbo, don’t get an intercooler built for stage 2 applications. You want an intercooler that provides the best cooling with the minimum pressure drop. If the right intercooler is over your budget, wait until you have enough funds or try saving on other mods so you can get the right intercooler. As mentioned above, getting a bigger intercooler does not always mean you are getting better performance. You might get better IAT than stock, but your pressure drop will be higher and so the couple hundred dollars you spent on a cheap solution did not help. If you are not going to pick a brand that takes into consideration everything mentioned above, you are better off keeping your stock intercooler. As i said earlier, dont get the biggest most expensive FMIC if your car is a daily driver with stage 1 tune. Talk to vendors / tuners, tell them your HP goals and mods + your budget. They will recommend an FMIC that suits your needs. This thread would be more ultimate if you showed pictures of the cores of various units so we could have a good sense of comparison across the manufacturers. Intercoolers are so necessary on this platform too. I made my first two passes at the 1/8 this weekend in my 335is. Ambient was around 70*, DA was 1350. At the end of the first pass IATs were 140*. I let the car cool of and IATs were 150* after the second pass. The stock intercooler is terrible. I am currently FBO minus FMIC. Only other mod I may do is Stage 2 LPFP (no inlets, no hybrid turbos). Running MHD Stage 2 currently due to low winter temps and planning to run that year-round in So Cal. With the LPFP upgrade, I'd probably run the E40 OTS full time. No track time, no drag racing. Should I go with the VRSF 7" or will the 5" suffice? Everyone I've asked that I know recommends the 7" due to size but this thread is making me reconsider. I have a lot of different intercoolers in my life. I have had a lot of cheep ebay china intercooler from ebay before. I had an ETS intercooler on my evo and i have a custom garrett core intercooler on my s2000 and i have a 7"VRSF intercooler on my 335i. 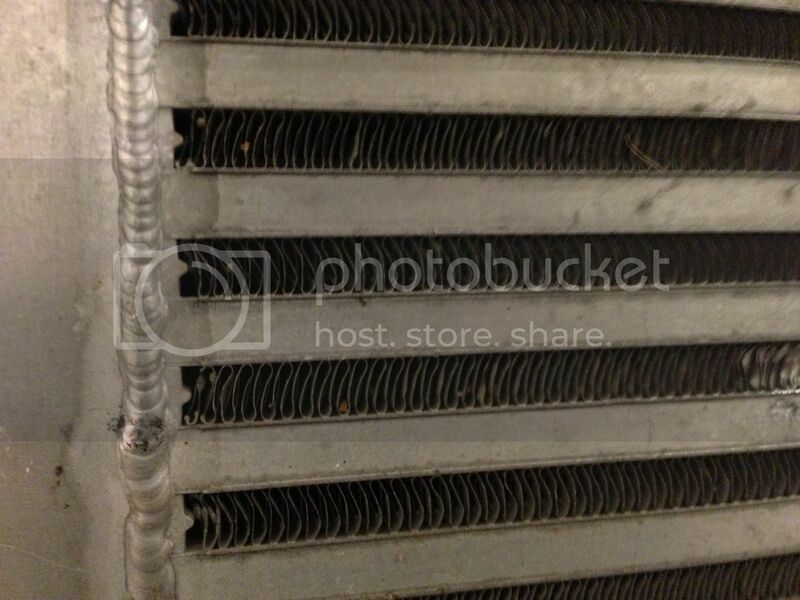 The china/ebay intercoolers do look very bad up close due to how much space there is in between the fins. 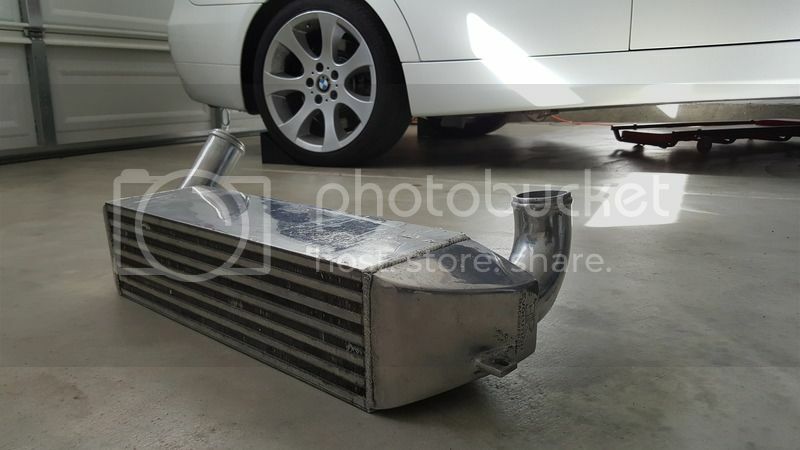 My vrsf 7" intercooler on my 335i in my opinions look very bad just like a china intercooler. The fit and finish is quite poor. But people say it works good. The ETS intercooler i have on my evo looks great and the fin density is quite good. The best by far is my custom 24x12x3.5 garrett core intercooler on my s2000. The fin density is very very dense. Jb4 with e85 hybrid back end flash, vrsf down pipes, vrsf 7" intercooler, vrsf charge pipe with tial bov and afe intake. Fuel it stage 2 pump and ethanol content kit. I had an AMS core on my car prior and I just recently upgrade to the AD Engineering 1000 HP FMIC. Both Quality cores. But if you want the best, go ADE. AMS is a great core... I had one of those on our car several years back. Also like mentioned above the ETS is a fantastic core. The Evolution Racewerks is another SUPER high dense core across all their FMIC models. AD Engineering makes a great FMIC but overkill for a typical stock turbo guy. whoa did that thing fit under the radiator ?? Having my helix($$$) or your vrsf is not going to make a lick of difference in 1/4 mile times all things being equal. Really show what a great CORE there is in the ER FMIC. Since both options you are picking are the same price and your car is FBO, i would go with the 7"